Last month, I purchased the Mad Catz Arcade Stick at my local Best Buy. I gave it a try for an evening, then I returned it to the store because it wasn’t worth the $50 I just paid for it. I thought about doing a review, and decided I would be too harsh and critical and gave the thought up for a while. Well, I was in Best Buy again last week, and noticed an open box unit (not the one I returned, as they have been out of stock for about 3 weeks) and decided I’d buy it and give it a try. After all, this unit was marked down to $25.99… much more affordable, since it comes with $20 of XBLA (XBox Live Arcade) games. So, let the review begin!! The stick comes nicely packaged and includes three XBLA games. It’s a very tempting purchase at the store for a mere $50. *grin* (Hey, I spent over $2500 on my MAME arcade cab if that gives you some perspective). The games included are AstroPop, Time Pilot, and Frogger. The stick includes every button and function included on the original controller, plus a “Spinner” and some turbo functions. I have included a few pictures so you can see the different angles of the stick. As you can see, there is a cable on this stick, and it has a USB port on the end, and I plugged it into my PC, as well. It is recognized as an “Arcade Gamestick” and works like any other PC controller if you care to use it as such. 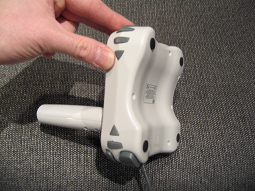 There are no suction cup feet on the unit to stick it down, so it is intended to be held in the hand like a modern controller, and not used like a traditional arcade stick. I think this is a new title for XBLA that takes the principals of classic gaming and adds some newer graphics and it has a pretty good feel to it. You move your paddle around the bottom of the screen and collect blocks from the top and push them back up to make groups of four. When you get a group of four, the blocks disappear and can cause a cascading block removal affect if done properly. There are lots of special blocks that remove rows or columns, etc. This title was a good choice to include with the stick as it makes good use of the “Spinner”. 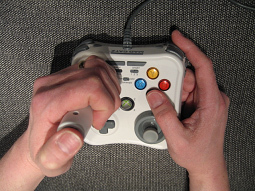 It was more difficult to play with the D-Pad or the analog thumb stick on the usual 360 controller. Over all, I’d say the title is pretty fun, and I’ll be going back to it. I think this game might work better with a more accurate control unit like a mouse or real arcade spinner or paddle. You can get a PC version (http://www.popcap.com/launchpage.php?theGame=astropop) as well as download the trial from XBLA. Ok, I didn’t play the original version of this game back in the day, but I really enjoy the XBLA version. There are some updated graphics and it had some good game play. You use the joystick to point your ship where you want to go and it feels like it has an analog directional component to it, even though it is 8-way control. Of course, you shoot the stuff coming at you, and progress though time to fight better and faster enemies. Again, this title was well selected for this stick, as the loose feeling analog joystick component allowed you to swirl around and shoot where you wanted to go most of the time. However, I preferred the analog thumb stick on the original 360 controller for this game as it was easier to control, and I got higher scores and farther in the game. Ok, everyone should know what this game is. The XBLA version has some updated graphics and some interesting achievements to accomplish. 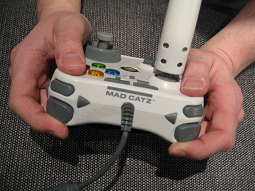 Once again, Mad Catz chose well as this game works decent with the D-Pad. But not decent enough to be any better than the original controller. 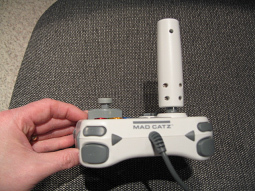 It was pretty much the same experience with the stick and the original controller. I keep putting that word in quotes because it isn’t really a spinner… It’s more like a paddle, but not even that. When plugged it into the PC, I could see exactly what it was doing. If you rotate it slowly, it is hitting the D-Pad sensor slowly to the left or right. If you rotate it more quickly, it is hitting the sensor quickly. That is why it worked well for a game like AstroPop. I think this “Spinner” was about as good as could be done considering there isn’t another way to have fast analog control for a device like this on the 360. This is the main reason I re-purchased the stick. I figured the $20 for the games was good, but this “Spinner” was worth the other $6 of the $25.99 I paid. Since the stick is square, it can be rotated and held in different orientations in your hand. This worked well for the “spinner” except for the fact the cord is in the way when rotated. This “spinner” might be useful if the rumored Tempest and Warlords are released for XBLA anytime in the near future. Of course, this depends on how MS implements the control. The joystick itself is loose and sloppy. They just added a plastic tube to a regular analog thumb stick. You have to move the joystick too far in any direction to make it worthwhile. It’s like they wanted to give you the feel of an old Atari joystick, but tried to mix it with analog control. It just doesn’t work well. The button on top of the joystick is practically worthless, as well. It didn’t feel like any top-fire button I have ever used on anything. It had too much resistance and I couldn’t fire very fast with it. 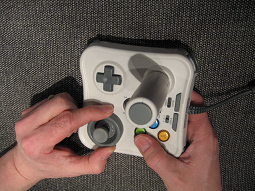 Oh, and since it is just an elongated thumb stick, you could actually click the whole thing down with a large amount of force, as if you would be using this thing for any normal 360 game. Now, we come to the shoulder buttons… Once again, there is no need to put a shoulder button on this thing. You can’t even reach the left shoulder buttons if you are using the joystick or D-Pad as your finger won’t reach. 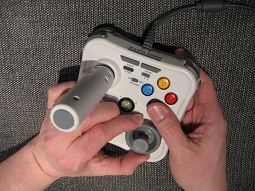 Ah, the D-pad, and you thought the original 360 controller had a bad D-pad. This one kind-of works, but not well. It is nice that it is slightly larger than the original 360 version, but that’s where the good stops, and the bad kicks in. If you only use it as a touch pad for up-down-left-right, then it functions properly. However, if you try to hit diagonals, or use it in other 4-way games where you are sliding your thumb around, then you find that the control sticks. For example, you are playing Ms. Pac-Man, and you are going left, then swoop your thumb down for the next corner, the D-Pad doesn’t release the diagonal direction. I verified this on the PC control panel, as well. If you swoop from one direction to another, it holds the diagonal even though you are clearly pushing up-down-left-right at the end of the swoop. I think it is a really, really bad pad. Heck, I did try two of these things, and both did the same thing. The second unit seemed a little better, but it still made some games unplayable. I really can’t recommend anyone buying this stick unless you get it at half off like I did. And then, it’s only worth it because of the games that came with it. There might be some merit to having the “spinner”, but only if you must have a better control for AstroPop. I don’t think this arcade stick is anything like a real arcade stick, and it’s worse than the original 360 controller in all cases, except for AstroPop, thus far. I also tried it in Dig Dug, Ms. Pac-Man, Gauntlet, Robotron, and on Geometery Wars for the heck of it. It failed to be worthwhile in all cases. Of course, it’ll never get used for any Full 360 game, either. Yeah, I may have been a little harsh. At least when you read the “good” reviews on some other non-arcade web site, you won’t be fooled into wasting your money without knowing what you are getting into. This isn’t an arcade stick. This isn’t an Atari stick. It isn’t a real spinner. It isn’t a good D-Pad. 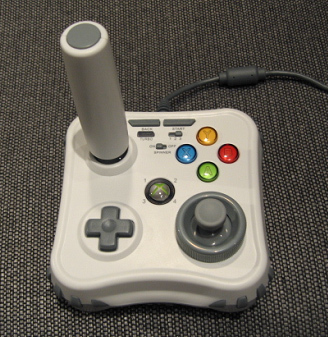 It IS just a few good games with a crappy plastic stick good for making a REAL joystick someday.